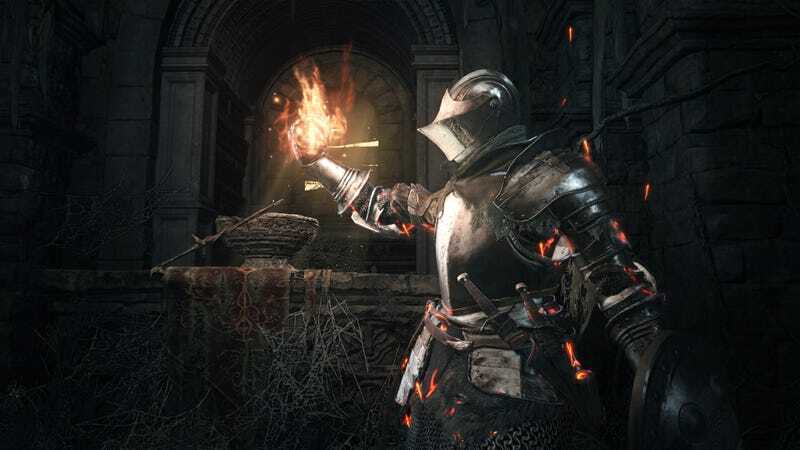 When Bandai Namco’s Twitter promised “big” Dark Souls news was coming today, it could have been anything. A Dark Souls movie? Details on the game’s DLC? A remastered Dark Souls? Nope! Turns out it’s a really lame clothing line. It’s a store full of crappy memes about Dark Souls! You have a series full of incredible art depicting fantastic worlds, and you celebrate it with...this? The response from fans has been negative, but that’s not shocking. Bandai Namco shouldn’t have called this big news—it’s definitely not. The series’ most passionate are already grumbling over the game’s staggered release schedule, resulting in much of the game being picked apart and streamed. “Big” news for fans would have been a surprise early release date! If that’s not enough, they’ve dumped every meme onto a single t-shirt. Git Gud or Go Home????? Please stop, Bandai Namco. Please stop. Oh, and it’s almost like I’ve seen this on an old Olly Moss t-shirt before? Granted, this alive/dead/hollow design isn’t bad, and if my hair could deal with hats, I could be convinced to walk around with one saying praise the sun. There’s really cool Dark Souls merch out there, too! You don’t have to look far. Fortunately, Dark Souls 3 is only days away. I’ll have a review early next week, but here’s a preview: if you like Dark Souls, you’re gonna wanna play this one.